Vagrants are three radiant NPCs found in The Ratway Vaults in Riften. They wear random clothes, boots, gloves, and a hat. 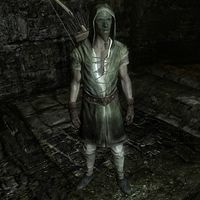 They wield an iron dagger and use a leveled bow (up to Imperial quality at level 7) and twenty leveled arrows for ranged attacks. Additionally they carry a selection of raw food, a leveled amount of gold, and have a good chance of carrying a lockpick. This page was last modified on 8 September 2016, at 03:53.